Teen Activity Programme 2018 – English and Surfing! We recently had three wonderful TAP students here with us at Lexis Byron! The Teen Activity Programme combines English classes with surf lessons, so they really get the best out of their Byron experience! What’s the best thing about Lexis Byron? Sacha: I liked that it’s a small campus, so everyone knows eachother. It’s really easy to talk to people and make new friends. Theo: It was a really good combination of study, surf and free time! I also really loved my homestay. Alex: Improving my English! I also really enjoyed the table tennis (Alex came a close second in our July Tournament!). Sacha: All the teachers are really nice. They encourage you to participate and mingle with other students. We played lots of really good games that got us to mix together and get to know eachother. Theo: I loved my teachers, Paul and Michelle. We would always do activities in class that would get us interacting and speaking with other students. Alex: My teacher Claudia was very useful and interesting, because of her lessons I am sure I have improved my English. How were your surf lessons and instructors? Sacha: Really good! Because Theo and I already knew how to surf Let’s Go Surfing gave us private lessons instead of us having to go with the group. They would always take us to where the good waves were, they really knew the best spots each day. They were very kind, friendly, fun and gave good advice. We often had dolphins really close to us when we were surfing, which was an amazing experience. Theo: Great! The instructors were really good and helped us improve. They always checked where the best waves were first and took us to so many different surf spots over the 4 weeks; Broken Head, Suffolk Park, The Pass, The Wreck, Belongil and Lennox! Alex: My surf lessons were awesome, even though the waves weren’t really big every day. Dylan and the other instructors do an amazing job. Did you enjoy your homestay experience? Sacha: Yes, they made me feel welcome and gave me good advice on Byron (Sacha’s homestay father Mark even took him to see how surfboards are made!). I felt well looked after but sometimes wished I was with a family with another teenager, like Theo was. Theo: I loved it! My host family had 2 boys similar age to me (14 and 17) so I spent every evening with them. They were also the same surfing level as me so we would go out surfing together. Alex: Awesome! What a family! The Monrows are the nicest people I have met here. 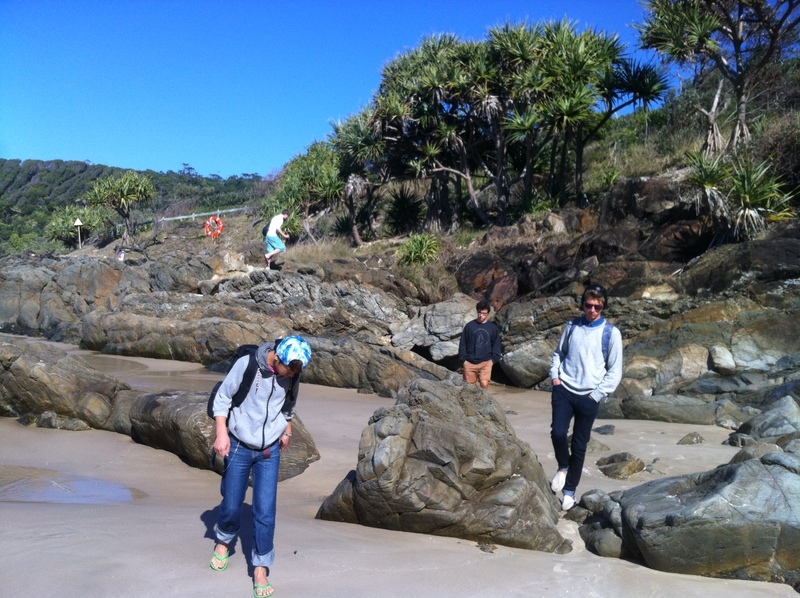 What was your favourite thing to do in Byron when you weren’t studying or surfing? Sacha: Finding good places to eat; there’s lots of reasonably priced places for food. There’s also lots of shops! The lighthouse is really nice, we saw a wallaby there; I always appreciated these moments. Theo: Hang out with my host family. Alex: Ride my bicycle in town, or to the top of Byron to see the view, and sometimes do some shopping. What would you say to someone who was thinking about coming to Byron to study? Sacha: Go and do it! It’s a really good experience. It’s a small town so makes a change from being in the city. All the people are really kind. There’s good food and surf to enjoy! Theo: It’s a really good school for surfing and studying. Byron is a great location for trying out lots of different surf spots. Alex: Everyone has to do what they want to do! Byron is best for surfing, but studying at Lexis was still very useful! It’s TAP (Teen Activity Programme) season at Lexis Byron Bay! At this time of year, budding young surfers from all over the world come to join our English and Surfing programme, where they study English in the mornings and have a surf lesson in the afternoons. Claire, our Student Services and Activities Officer, is amongst the staff members here to welcome them and help them with any questions they may have. Other than English, I speak basic Spanish and French. In the future I would like to try and learn Japanese; so far I can say hello, goodbye and thank you! I’m from England so lived there most of my life before moving to Australia nearly 4 years ago. I have also lived in Spain (where my dad lives) and worked in Guatemala for 2 months training native speakers for English speaking roles. The amazing team I get to work with and being part of the student’s journey! We really do have such lovely students who come to Lexis Byron and it’s wonderful to be able to help them and watch their confidence with the language grow. As well as being very rewarding my job is also a lot of fun! 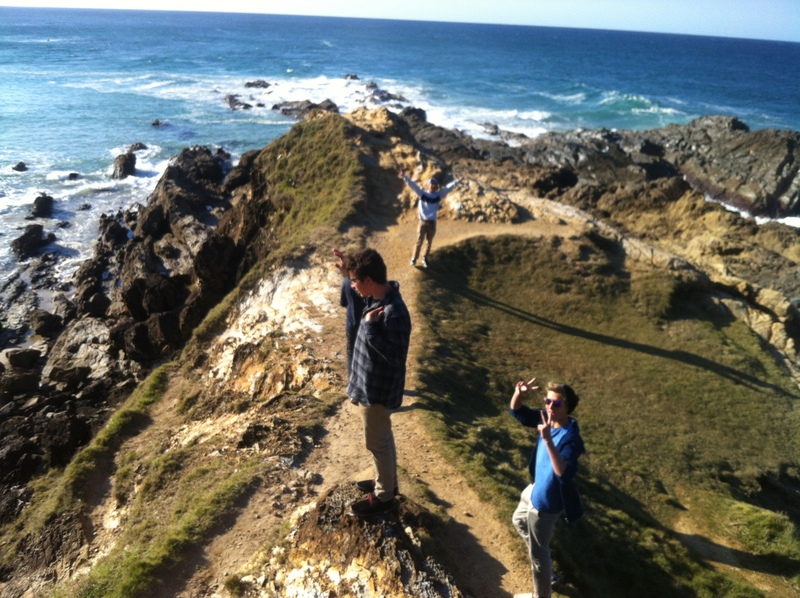 What are the most popular things that Junior students in Byron Bay enjoy doing? Surfing is of course the favourite and Byron is one of the best places in the world for this! They also enjoy meeting students from other countries and being able to hang out with them at the beach after a morning of studying! When they’re not surfing or at the beach we also have free afternoon activities they can participate in; with skateboarding, soccer and volleyball being amongst the most popular with the juniors! What is Byron Bay’s best-kept secret? Winter is the best time to come to surf! There are far fewer people so it’s much easier to catch your own wave! What is the best advice you could give to juniors and their parents? Coming to Lexis Byron Bay will be an unforgettable experience they will forever be thankful for! When they are here they should talk with students from other countries so they can practice their English as much as possible, and have new friends to visit once they return home! TAP STUDENTS – TEEN ACTIVITY PROGRAMME!! Last month we had a group of TAP students here with us at Lexis Byron Bay – this is our Teen Activity Programme that includes 4 surf lessons a week alongside 15 hours of English lessons. I asked each of the students to tell me a little bit about their experience and their thoughts on the school, surf lessons and Byron Bay! ‘I love Byron and it was great to come back and study at Lexis again; it’s a really good place to learn and make new friends. My teacher Claudia was so friendly and helpful. When asked if anyone wanted to go swimming they all said it was too cold. So instead we went and explored the Broken Head Nature Reserve! The boys had fun playing in the sand and hiking through the reserve! TAP’s Residential Surf Campers go Exploring! 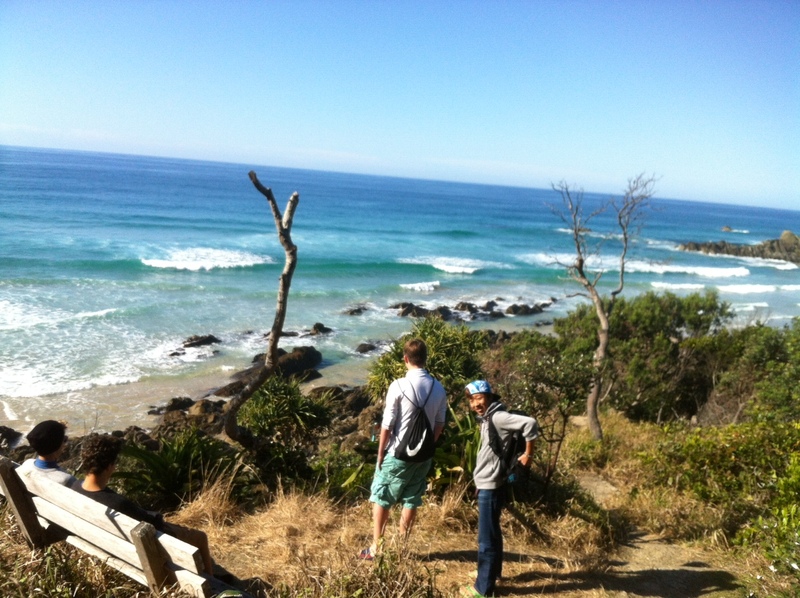 Today we went for a little adventure to see some of the surf spots around Byron and to learn a bit more about surfing. We even hiked to a secluded beach and to the light house and saw some dolphins and even whales!!! The boys looking for whales and just seeing Mirko’s tongue! 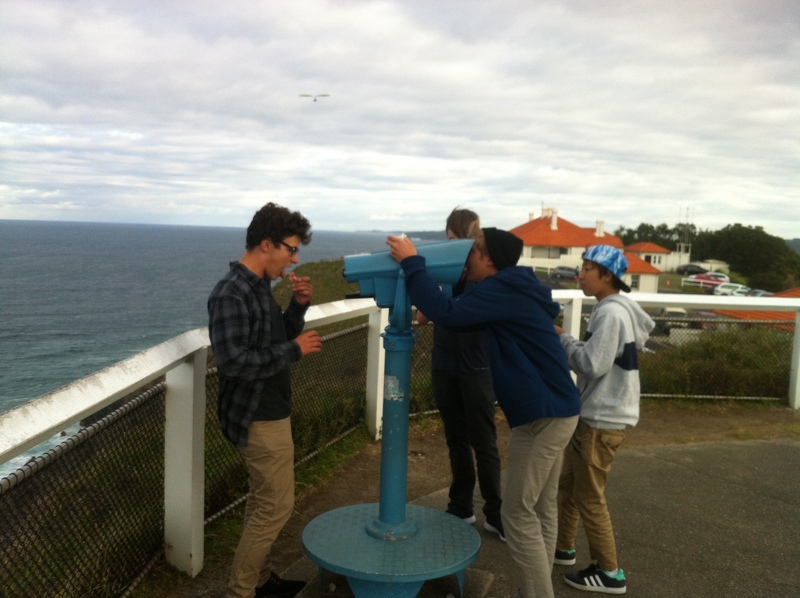 At the Light house the boys got some Ice Cream and were on the hunt for whales and dolphins. It was a long hike with a lot of stairs and we even went to the most easterly part of all of Australia! We watched a few pods of dolphins playing and saw some whales breach and splash their tails! 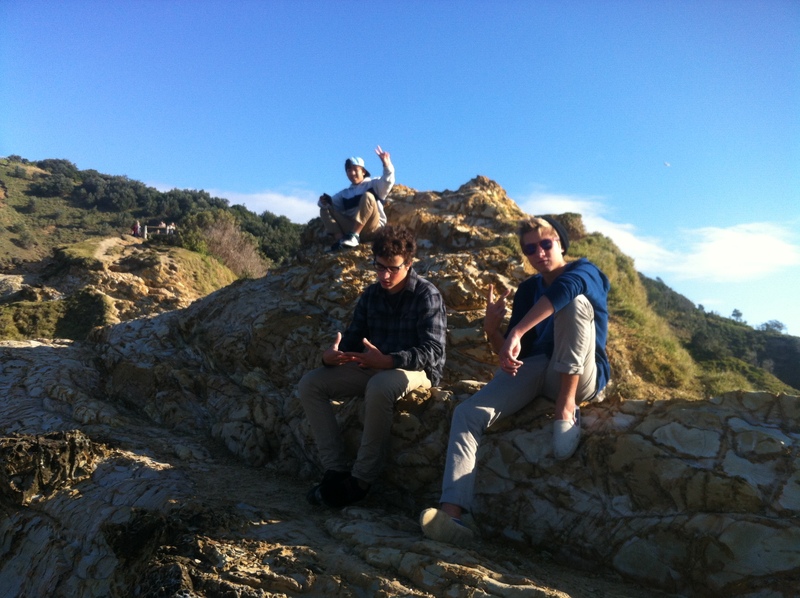 At little Watego’s the boys posed for some pictures at a beautiful beach on a great sunny day! 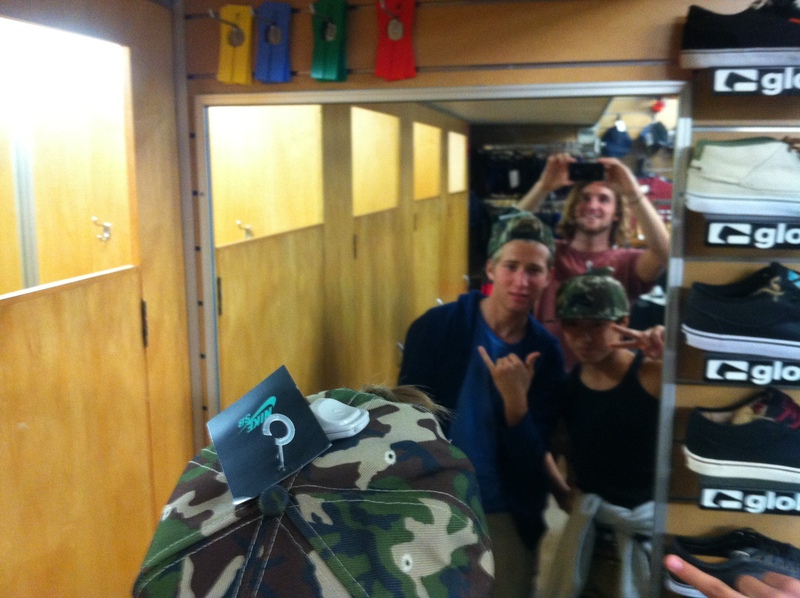 We stopped in at the local surf shop C-Skins and the manager Tom told the boys about surfing and surfboards! They even had some time to do a little shopping as well! The boys learning about boards from Tom, manager of our local shop C-Skins! Rodolphe and Yuki striking poses! It was a great day and the boys had a lot of fun!